Halloween is one of those things that I have always loved since a child. I think it stems from a deep-rooted fascination and romanticising of the darker elements of folklore and fairytales. Pumpkin carving, decorating the house, the smell of wood smoke in the air, the darker nights, dressing up. I was always one to revel in the magic. Which is why it really surprises me this year how much I am craving a quieter and more intentional passing of Halloween for Eilish. Less of a bedecked affair with costumes and decorations. More subtle nods, an evening burnished with the browns and oranges of Autumn, and pumpkins aglow on the doorstep instead. Here are some ways in which we will be celebrating Halloween a little more consciously and intentionally. Homemade decorations. This week we made a little pumpkin garland. Eilish painted the paper with finger paints and I did the cutting and threading. In years to come she can do more and more of the different elements, and the sewing will be a great handwork activity. You could also try ghostly figures from old muslins or perhaps a Halloween wreath. Picking our pumpkins. We had the best time at the pumpkin patch a couple of weeks ago picking our pumpkins straight off the vines and climbing hay bales. There is something so satisfying about picking your own and then coming home and putting it straight in the oven for soup. Decorating. We have placed a couple of gourds around the house, and updated our celebration ring. In an effort to be as conscious as possible we are eschewing the throwaway plastic of past and buying things that can be used year on year, and preferring little nods to the changing seasons and celebrations. Pumpkin carving. One that Toby and Eilish will be doing together at the weekend. Growing up this was always a tradition we did with my dad, something I’d like Eilish to have with hers. The pumpkin seeds we will roast and snack on, and then after the night ends we will be taking the carved pumpkin up to my grandparents, a gift for their compost heap. Baking. I always like to bake seasonally if we can, and with the abundance of apples from my grandad’s tree I’m thinking another apple cake is in order. If I can get my hands on some ghoulish cutters in time, I’d love to make a batch of these biscuits which Eilish can help make and ice. Seasonal books. I love to collect books that I know we can get out year on year for each annual celebration, its special to imagine bringing them out and seeing those memories spark each year. Eilish has been loving this sweet lift-the-flap book called Little Blue Truck’s Halloween which Eilish’s grandpa brought back from the US for her. The whimsical illustrations are just gorgeous. We’ve been accompanying it with all our current Autumn reads. Dressing up. I think we will give dressing up a miss this year. Until she can tell us what she wants to be, it feels a little self-serving for us to be dressing her up. However, last year I said the same and ended up dressing her up as a pumpkin at the last minute. She did look rather adorable! So never say never, I may well cave again… That being said, we are also trying to be very intentional with her wardrobe at the moment, so unless I see a second-hand costume that I can pass on myself, I don’t know if I would feel right buying anything. The night itself. I think this year we will be missing the trick or treating before next year when I imagine she will be all for it. When we do, I hope we can contain it to just three or four houses to bring down both sugar intake and overwhelm. 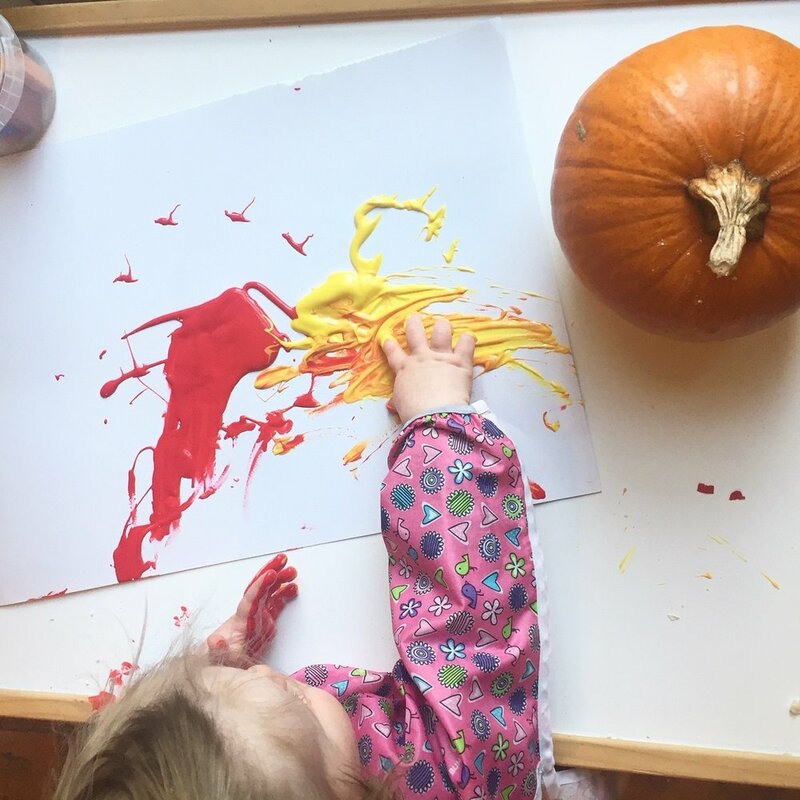 Instead, we will be cosying up at home with candles and waiting in for trick-or-treaters before our normal routing of dinner, bath and bed, with I’m sure another reading or two of the Little Blue Truck and his Halloween adventure squeezed in between. I love marking celebrations our own way now we are a little family of three, and it is so important that you do the same in ways that feel authentic to you and your family. How will you be celebrating Halloween?